This can be any home you like, from under the sea, to bird houses, to animal habitats, to lighthouses guiding ships, to even an actual house! The interpretation is up to you, and Marina from Cottage Crafts is offering an online voucher to the lucky winner, runner up and spotlights are also chosen along the way. I have made a bird house. The idea is from Joanna who made a beautiful one recently here. 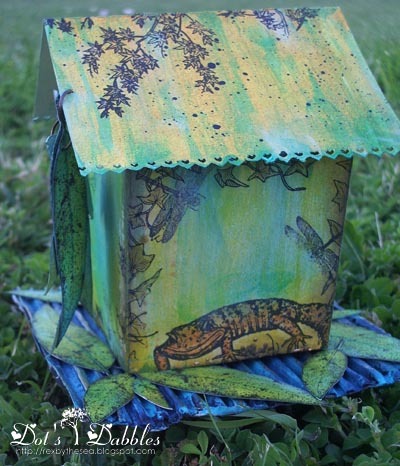 Dragon flies, spiders, and geckos are the stamps this time around. bare branches, ivy and gum leaves. it just seemed to tie everything together I think. that the stampettes have come up with. WWOOWW!!! What is left to say, seriously? Dot, bird house is exquisite! Love all the images and colors! Did I say, "WOW?" Happy Weekend! Hugs! 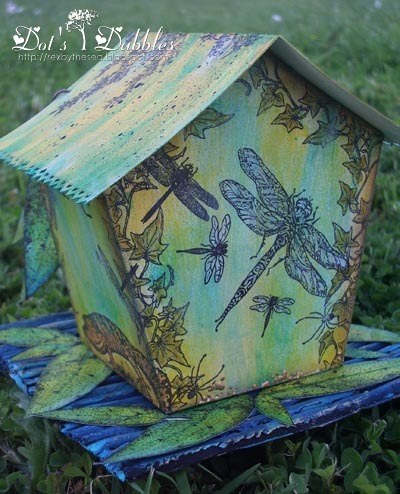 Your birdhouse is totally awesome Dot, the fusion of colours beautiful and very effective stamping. I'm just about to write have a good Sunday but of course I imagine it's evening there by now. Wow, Dot, I'm really missing words, your house looks wonderful. Fantastic color and stamping – I just love it. OMG Dot! This is totally awesome! I'm amazed you made it from scratch as I thought it was altered. 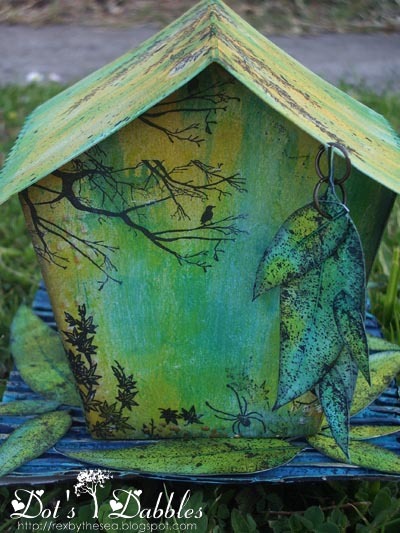 Awesome birdhouse, love all the stamping details and colours. WOW Dot, this is fabulous, and I LOVE the stamps you've used, so original! A fabulous idea for the Home theme. Beautiful inky background and the stamping is sensational. This is fantastic Dot, great house and such beautiful colours. Gorgeous Dot, it certainly does have the wow factor with such beautiful stamping and the stunning colours. Thanks for playing the UnCard Rebel Challenge on RRD! WOW, beautiful house, it makes me long for spring! This is amazing! wow! what gorgeous colors. Thanks for sharing it in our AG challenge this week at Penny's Paper Crafty. A fabulous home and a great interpretation of the theme. Your colour choices are superb and I just love the hanging gum leaves. This is so inky and gorgeous!! I saw this a few days ago and didn't have time to comment but I've come back to say wow!! I love the colours, the stamped images and those leaves hanging at the back. Very beautifull nature house , I really love it, beautifull colours use, and what a creativity!! !Well done!! !